Woodlands Week was part of a big month of community science in Armidale and surrounds delivered by the region’s New England North West Science Hub. In October and November, the New England and North West Regional Science Hub presented Woodlands Week, a series of community events in Armidale that celebrated the science of the region’s woodlands, the most common vegetation community in the New England region. Scientists, artists and the public combined to explore different aspects of woodlands: birds, nocturnal creatures, ants, plants and insects. The school community joined the fun by participating in the Far Out Science Film Festival organized by the University of New England. The Far Out Science Film Festival presented by the University of New England kicked off a big month in community science in Armidale. On the 27th and 28th of October, UNE hosted 1025 school students from Year 5 to Year 10 on campus. They were treated to sessions of hands on science across 17 activities, delivered by 45 academics and over 20 assistants. A fabulous addition to our days was fetival guest Stuart Harris, lead character of the award winning documentary Maratus. Stuart inspired students to think big, and outside the square with where science could take them. Stuart was also in the region for an evening of citizen science, where he was guest at the Inspiring Australia-funded Community Film Night. The event marked the regional premier of Maratus on Thursday evening, 27th of October, where free popcorn enticed almost 50 people to watch and learn about citizen science, peacock spiders, and the determination of two passionate collaborators. Questions ran for over 30 minutes, and feedback confirmed that we’ll be getting something similar back in 2017. Among Woodland Week’s events were Secrets in the Spotlight, an event that saw community members of all ages gather at Thalgarrah Environmental Education to look at fauna ecologist Phil Spark’s amazing collection of live frogs and reptiles. Kids and adults alike were enthralled to see these cryptic creatures up close and learn about their habits and habitats. Then it was out into the woodland with head torches and spotlights to see what could be seen. A ringtail possum was spotted, then Phil called up a Boobook Owl. The group then travelled down to the river to listen to different frogs calling and to hear platypus splashing in the shallows. The highlight was a 150cm eel caught in the turtle trap. All were equally horrified and excited to see this monster wriggle across the ground back to the river. Next morning was Breakfast with the Birds, a dawn gathering at Sunnyside State Recreation Area in the Yellow Box – Blakely’s Red Gum woodland. Participants were able to walk with local naturalist Peter Metcalfe in search of birds. Peter not only only pointed out birds as they flitted through the woodland; he also identified birds from their calls, even from a distance. Peter showed people that the diversity of birds was due to the different habitats in the area, including riparian shrubs, perennial tussock grasses and big woodland trees with hollows. The morning finished with a hearty breakfast of bacon and egg rolls and coffee. Also on the program was an ever popular Ant Blitz presented as part of the Armidale Tree Group’s Open Day. This citizen science activity led by the dynamic ant biologist Dr Kirsti Abbott saw teams of people exploring of the woodland on the lookout for ants. Following on from a previous Ant Blitz held in National Science Week in 2014, blitzers set food traps and explored a range of habitats in this urban White Gum Woodland. Once again, different species used different parts of the habitat in the woodland. Kirsti’s posse of amateur entomologists followed her throughout the day as she revealed the importance of these overlooked but ubiquitous creatures. Other activities included a session on Illustrating Insects Illustrating Insects at the New England Regional Art Museum who hosted artist Jan Clark. Jan she led a three-hour workshop for 20 keen junior entomologists. The kids looked at a range of insects and used the inspiration to create drawings of them, or their parts. Art opens up new powers of observation and so has much in common with science, as was evident in this workshop. 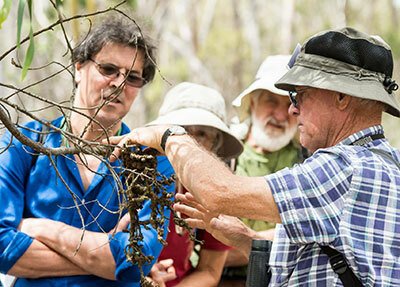 There was a Wildflower Walk led by Peter Metcalfe from Armidale Tree Group, during which a group of enthusiasts wandered through parts of Imbota Nature Reserve, one of the Armidale area’s best preserved woodlands. Pete pointed out the many plants that make up this patch of Yellow Box- Blakely’s Red Gum Woodland, as well as some of the birds that depend on the woodland as their habitat. Kate Boyd, the Armidale Tree Group’s leading bush regenerator also ran activities for Woodlands Week including two bush regeneration sessions in Armidale’s urban woodlands around the town lookout. She showed people how long term monitoring of these sites is used to make management decisions leading to healthier woodlands. As well as direct participants in the events, Woodlands Week communicated the science of woodlands through conventional and social media. Lots of people followed stories in the lead up to the events, then watched the events unfold live. Woodlands Week reminded everyone who participated that the ‘bush’ we see around us in and around town has some pretty special characteristics. The events and discussion showed the interactions between plants and animals and highlighted the science that is used to reveal these interactions. They also revealed the link between management, ecosystem health and ecosystem services. Once again, Inspiring Australia has supported great events delivered by the New England and North West Regional Science Hub in our region that help people appreciate the science behind their local environment. We look forward to our 2017 program. Dave Carr works Stringybark Ecological and is a member of the New England and North West Regional Science Hub. With support from Inspiring Australia, the group plan to continue its diverse science outreach efforts throughout 2017.